Local non-league clubs have expressed their deepest sympathies after a player collapsed during a cup game last night and later died. 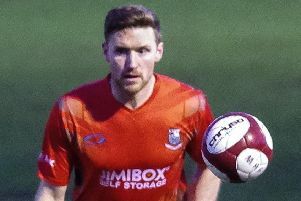 Defender Daniel Wilkinson was playing for NPL First Division South outfit Shaw Lane FC when it is believed he suffered a suspected heart attack on the pitch. The 26-year-old was treated by medics for more than 30 minutes before he was rushed to Calderdale Royal Hospital, in Halifax. The club later announced in a statement on their Facebook page that Wilkinson had passed away. Chairman Craig Wood said: “Our thoughts and prayers are with his family and friends at this time. Wilkinson started his career with Hull City before moving into non-league. Barnsley-based Shaw Lane were up against Brighouse in a Doodson Sport Trophy preliminary round tie when the the tragedy happened. The news of Wilkinson’s death has shocked the non-league world.